Tifferz & Her Sisterz Book Reviewz: I got my copy did you get yours? I am lucky to have received an ARC copy of Tiger's Quest. I was simply giddy when I got it in the mail. I even did a little happy dance. You see, I have become obsessed with the Tiger series all over again. (I actually read the first two books in the series when Colleen was self published) I just love these books. It is going to take a awhile to get them out of my system. Tiger's Quest will be take you on an emotional roller coaster ride as Kelsey, Ren and Kishan's adventure continues to break the second part of the curse. The book has two main parts: In the first part of the book, Kelsey is back in Oregon going to school. I like seeing how she copes with Ren back in India. The second part of the story details the adventures of Kelsey and Kishan as they are tested both individually and together. I know you all love Ren and I do too, but in this book we get to know Kishan a lot better. Though I am a true fan of Ren the white tiger, Kishan the black tiger has warmed his way into my heart as well. I really can't thank Colleen enough for sharing her Tigers with us. This book has everything. Trust me you will love it. I am hoping as the adventure continues and they break more of the curse both Ren and Kishan will have a happy ending. 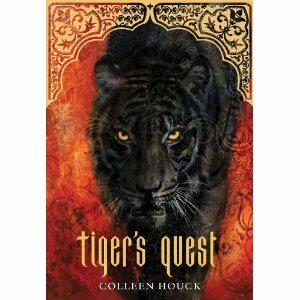 But we will have to wait and see as book three Tiger's Voyage comes out this Nov. 1st, 2011. This is a MUST have for your library. I just finished it and am going to read it again. I have already pre-ordered my hardback. I hope one day to meet Colleen and have her sign my books. So come to NC Colleen!!! !